Compatible with most compact digital cameras. 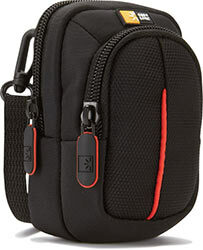 Accented with vibrant red detailing, the Case Logic DCB-302 Camera Case is tailored to fit most compact digital cameras. The case includes a zippered pocket for storage of memory cards and other small accessories. Carrying options include a convenient belt loop or detachable lanyard.